On Tuesday I shared my Pumpkin Mantel with you all. Your comments were so kind, and I got a lot of questions about the two Pumpkin Signs. I’m so glad you guys love them as much as I do, and I’m happy to say that they were pretty easy to create! I made this recent, and very exciting, discovery at Menards a few months ago. 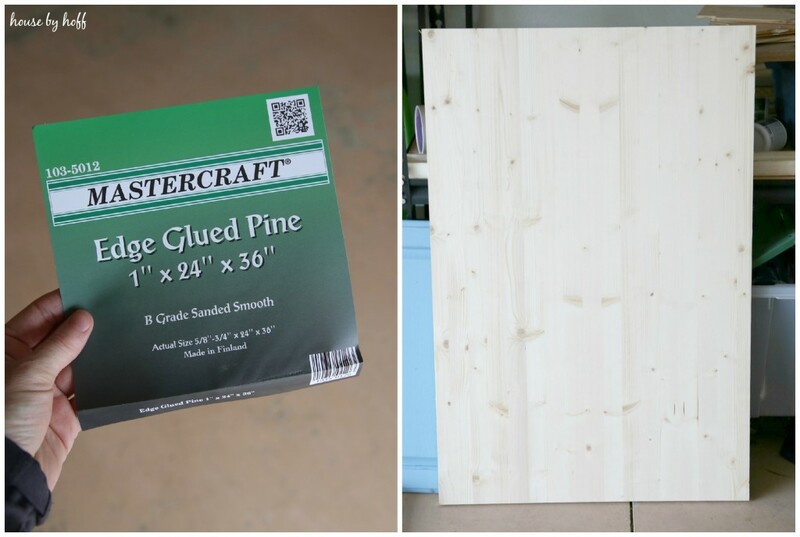 They sell these precut pieces of edge-glued pine for like $15-$20. 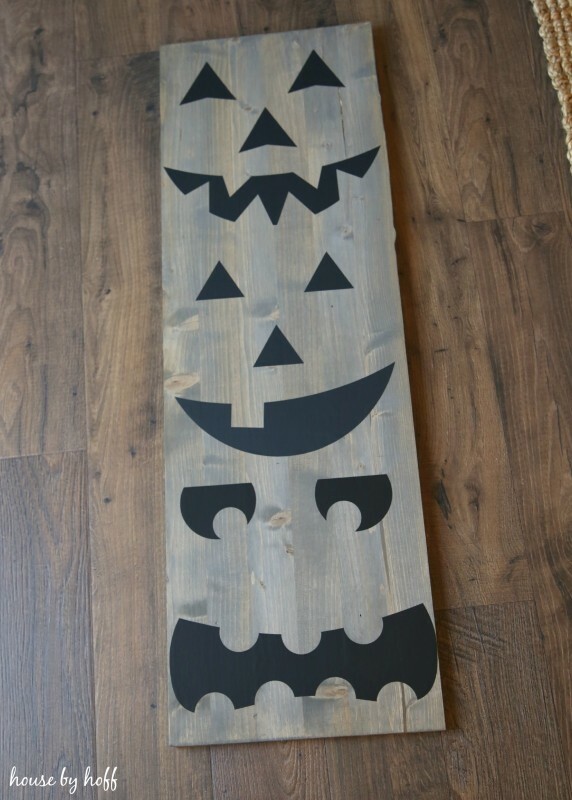 The size of this slab of wood is perfect for sign-making (1″ x 24″ x 36″), and for these pumpkin signs, we just cut one in half. I wanted my signs to be the perfect shade of grayish/brownish…or, another technical term, “driftwood-y”. I have stumbled upon the best way to achieve the “driftwood-y” color by combining two stains. First I apply one coat of Minwax’s “Driftwood” stain. 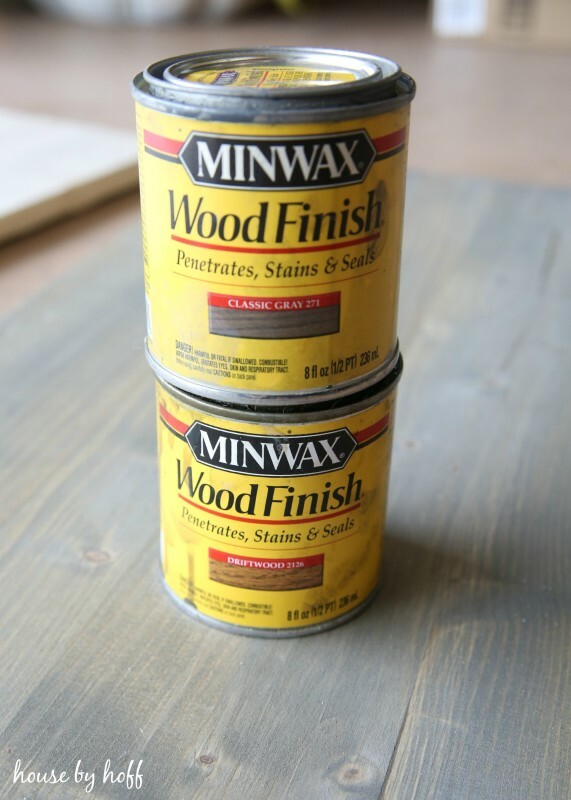 When it has completely dried, I apply one coat of Minwax’s “Classic Gray.” This combo works like a charm every time. I love the weathered look of these two stains combined! 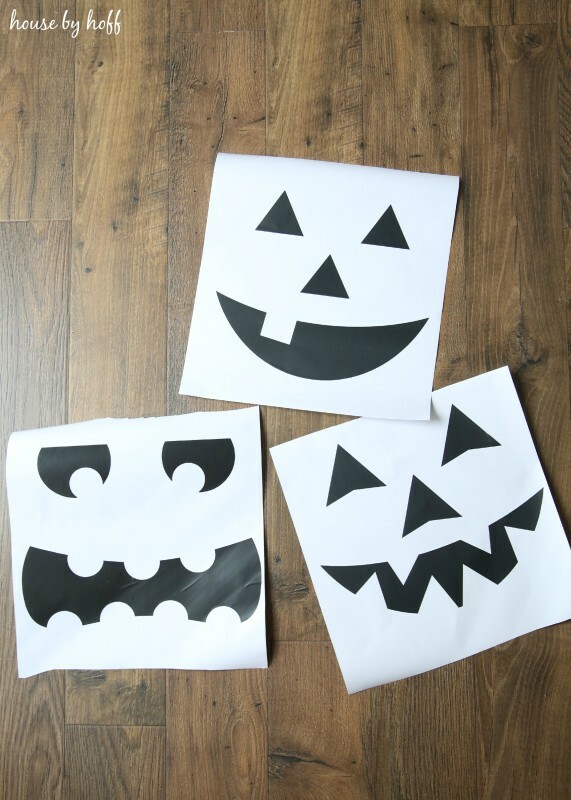 Next, I created vinyl stencils of Jack’O’Lantern faces using my Silhouette Cameo. I placed the vinyl cutouts onto my board, and I painted over them using a dry-brush technique. (Dry-brushing simply means that I barely got the bristles of my paintbrush wet with paint, dabbed off the extra, and “dry-brushed” over the top of my cutouts.) I use this technique because it gives the signs a very weathered appearance without having to sand or make a mess. Miss L. helped me peel off the stickers, and tada! The faces of the Jack’O’Lanterns appeared! Now, for my non-Silhouette Cameo friends, if I were you, and I wanted to make a sign like this, I would suggest printing off large Jack’O’Lantern faces, cutting out the eyes, mouth, nose, etc, and tracing them on the wood. Then, I would just paint in the shapes, giving you kind of a reverse of what I did…eh? You also might try combing Etsy for some vinyl Jack’0’Lantern faces. 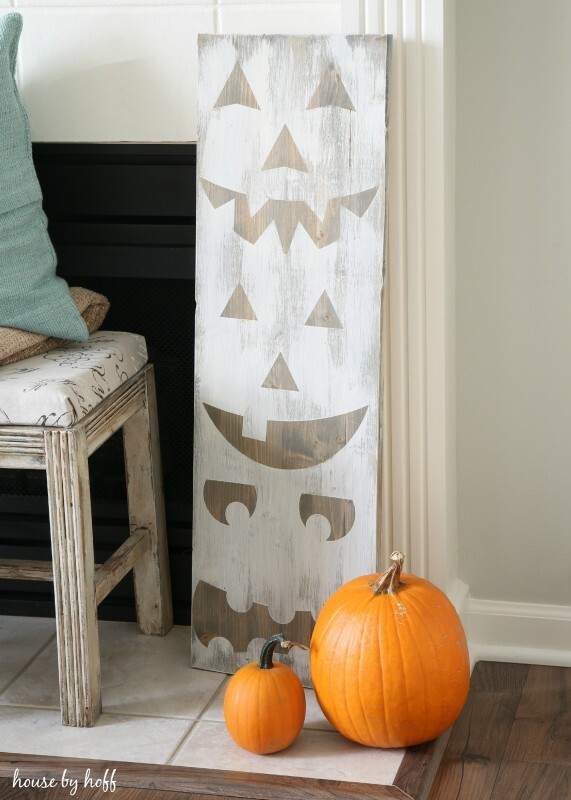 *Update: In the comment section below, Maria suggests printing out the Jack’O’Lantern face pieces, cutting them out, and tracing them onto painter’s tape…this would be a great way to replicate this project if you do not own a Silhouette Cameo…GEINIUS!!! Just for fun, I put together a gallery of my favorite Halloween and fall projects from years past! Check them out! These are just soooo cute. I’ll have to try them this weekend. I do have a Silhouette but I moved and haven’t unpacked it yet. What I’m going to do is print out the Jack O’ Lantern faces onto printer paper and cut them out. Then trace the faces on painter’s tape and cut them out. Then they will stick to the wood like vinyl. The painter’s tape can be layered if it is not big enough for the image. Love this project! 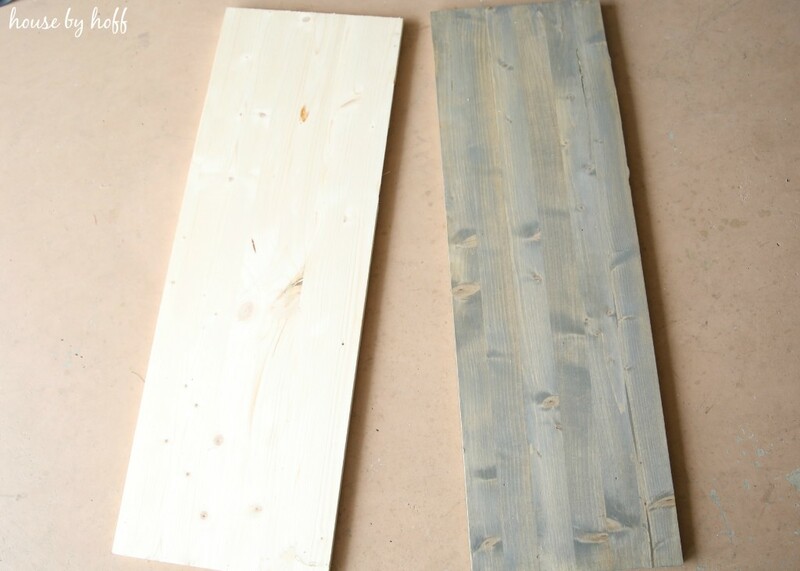 Thanks for the tips on creating the driftwood grey finish on the wood – I think I’ll be using that one a lot. These are awesome April! 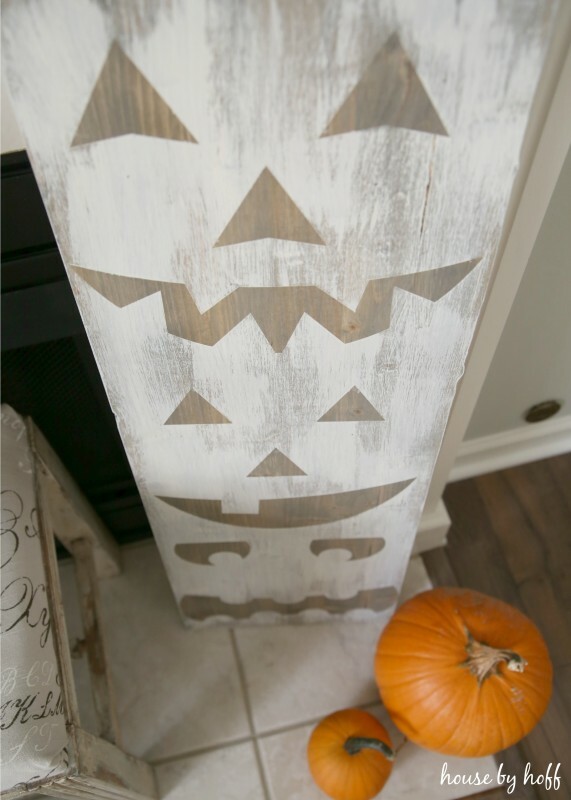 Such a pretty way to add a little Halloween feel! 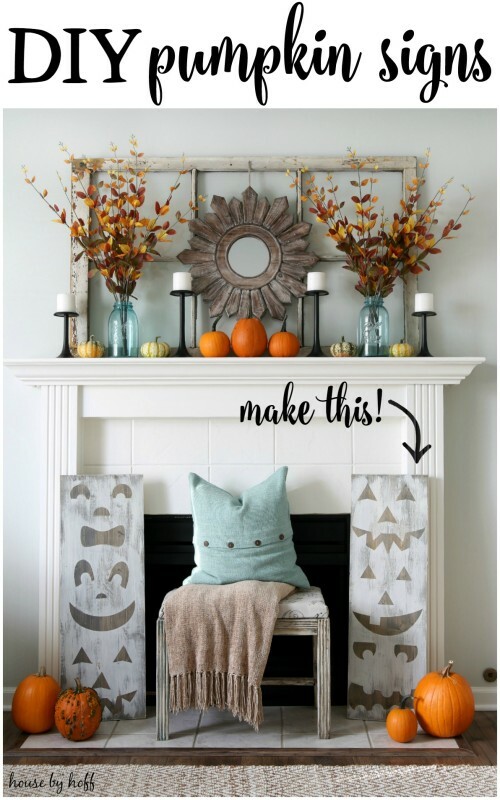 I am super in love with your entire mantle, and the added distressed pumpkin signs were the perfect touch. And how easy? Thanks for sharing! What did you use to dry brush with? Just some white paint. Sorry if I am being dense here!! Such a cute idea for Halloween! I love this idea so much that I may use this idea for signs for every holiday. Thanks for sharing! I tried the stains and no luck. Just makes the wood more yellow. I used pine wood though so I don’t know if that’s why. I have the worst luck getting that grey look. Any suggestions? I’m sorry to hear that, Sarah. I’ve never had that problem, even though I have used this combo on pine. Maybe just use the gray alone? Love these signs! Thank you so much for posting. Where did you get those slim black candle holders?